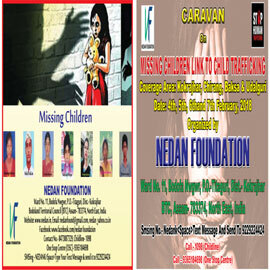 NEDAN Foundation is going to organize four days (4th, 5th, 6th & 7th February, 2018), CARAVAN on “Missing Children linked to Child Trafficking” covering the four districts of Bodoland Territorial Council (BTC), Assam. The flag off ceremony will start on 4th February, 2018 from KDSA Playground, Kokrajhar and the culmination ceremony will be held on 7th February, 2018 at District Court field, Udalguri, BTC – Assam. Looking towards everyone’s support & cooperation.